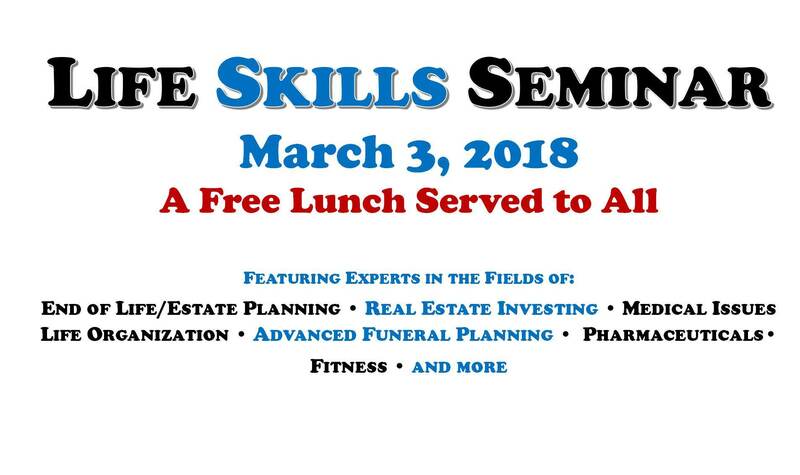 Life Skills Seminar: On Saturday, March 3rd, 2018, from 9:00 a.m. to 2:00 p.m., we are pleased to have Mayor Domenic Sarno as the keynote speaker as well as many other professional people coming to speak to us about investing, fitness, pharmaceuticals, medical issues, funeral planning, mental health, CPR, and much more. Everyone is invited and it’s all free. Spread the word to family and friends: the day includes a free lunch and an infinite amount of good information for your life. We do need help with publicity for this event. Please take a poster from the table in the stoa and spread the word to friends, relatives, and co-workers.